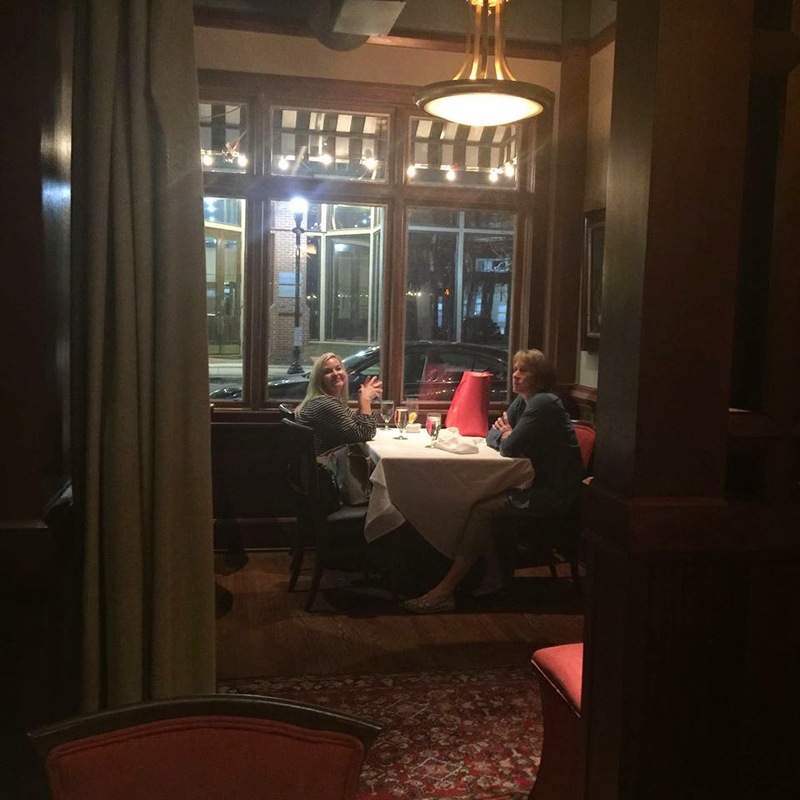 If you are looking for an elegant little spot for dinner or maybe just a night out without the kids, look no further than The Bottle in downtown Huntsville. 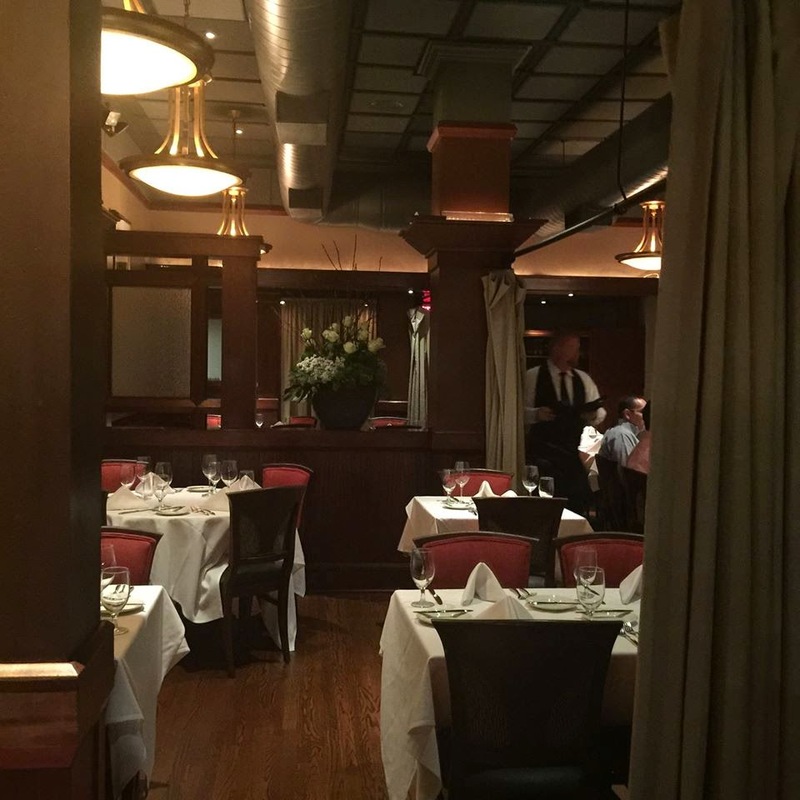 Located on Washington St. right off the square, The Bottle is just the kind of upscale restaurant for a special celebration or quiet get together with friends. Lucky me, I have been twice in recent weeks, once with two of my best girls and once with two friends who really are family to our family. On the first trip, here is what we ordered. Our friend, Greg, got this delicious looking tomato basil soup. I can't believe I didn't order it, too. 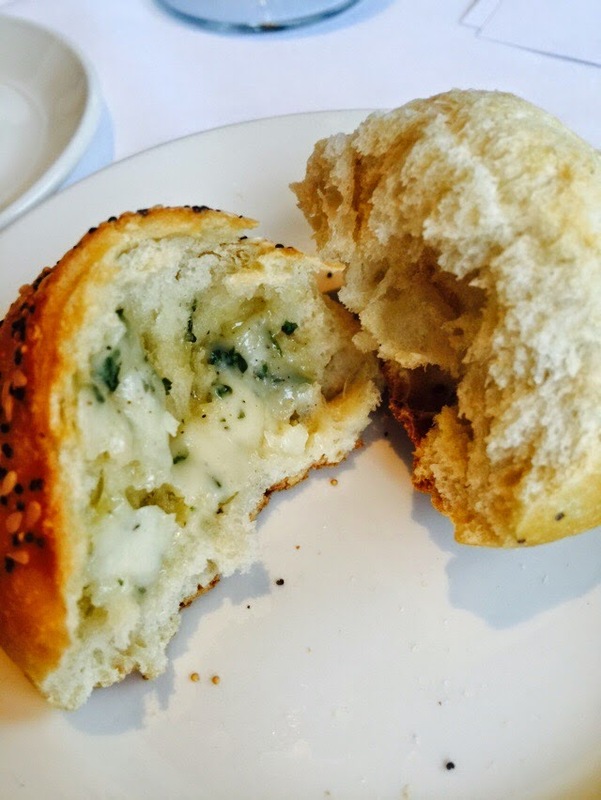 And the rolls with herb butter are a singular reason to visit The Bottle. Delish! 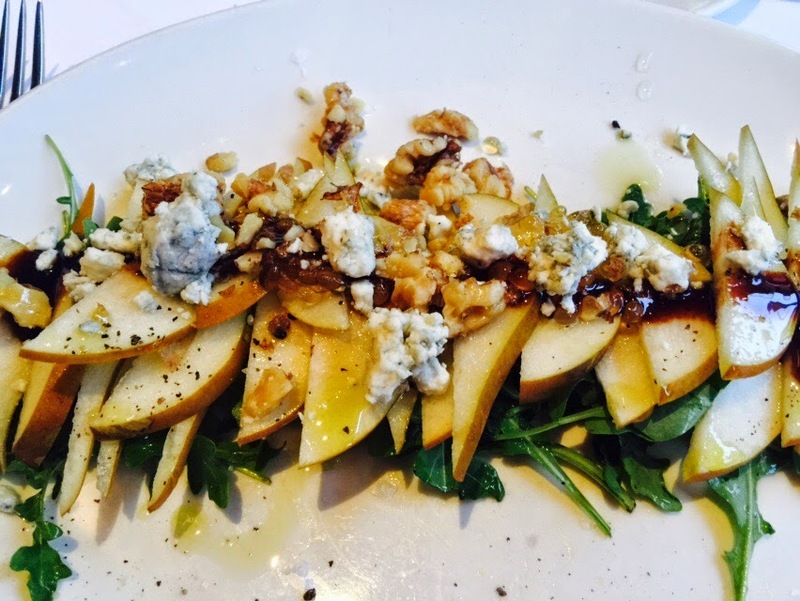 For both of my visits, I ordered this pear and arugula salad with toasted walnuts, blue cheese, honey caviar and a balsamic gastrique. I guess you could say I loved it! I am showing both pictures of my salad here because, even though they were the same, they must have been prepared by different people. The first one was kind of a jumble, but the second time it was very composed. Both times it was delicious! The pears were sweet and crisp, the arugula was fresh and peppery and I am in love with honey caviar! I'm not sure how they do it, but they are like sweet little pearls of honey that explode in your mouth. Also, sticking with the pear theme, both times I enjoyed this delicious concoction called, A Lovely Pear, and it was! It was made with Absolut Pear, Triple Sec and muddled pears. It was deliciously light and refreshing. 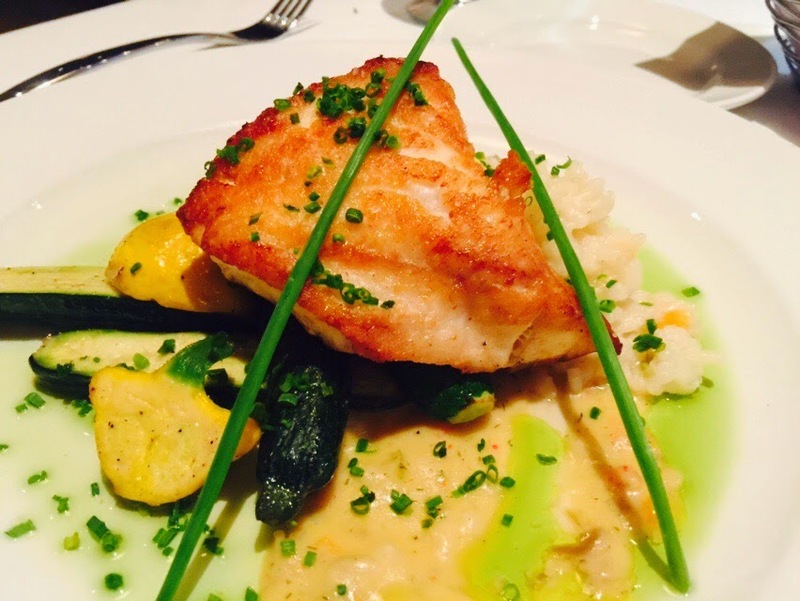 Our friend, Malinda, ordered this beautiful piece of fish (I've forgotten exactly what kind) perched on top of risotto with a medley of squashes. It looked like it was perfectly cooked. I chose this crispy fried quail with mashed potatoes and a celery root puree. It was so good! Greg had grilled New Zealand rack of lamb, rare, with couscous, roasted horseradish glace and haricots verts. He said it was very good, but so much there was no way he could eat it all. Scott's selection was Hereford beef filet mignon with horseradish blue cheese chive butter, demi glace, mashed potatoes and broccoli. He loved his dinner, which is saying a lot. He is very picky about his steak, so the chef must have cooked it perfectly. The best part of the dinner? Catching up with two of our oldest and dearest friends. We always have a wonderful time together. We love them and know they love us, too. That makes any dinner special. On the second trip to The Bottle, my friends, Dede and Deborah and I enjoyed a much needed and spontaneous girl's night out. 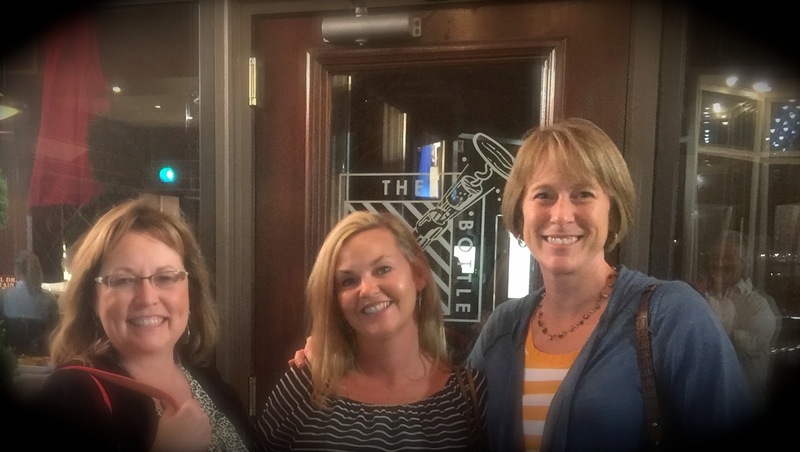 We planned to go with our friend Allison to celebrate Dede's birthday. Then Allison had to cancel, so we decided to reschedule. We rescheduled, but then we had the brilliant idea to squeeze two trips out of the situation by going as we had originally planned and then going again when Allison could join us. The old saying, "if you give them and inch, they will take a mile", definitely applies to us! We each enjoyed a different salad, so we could sample a variety. 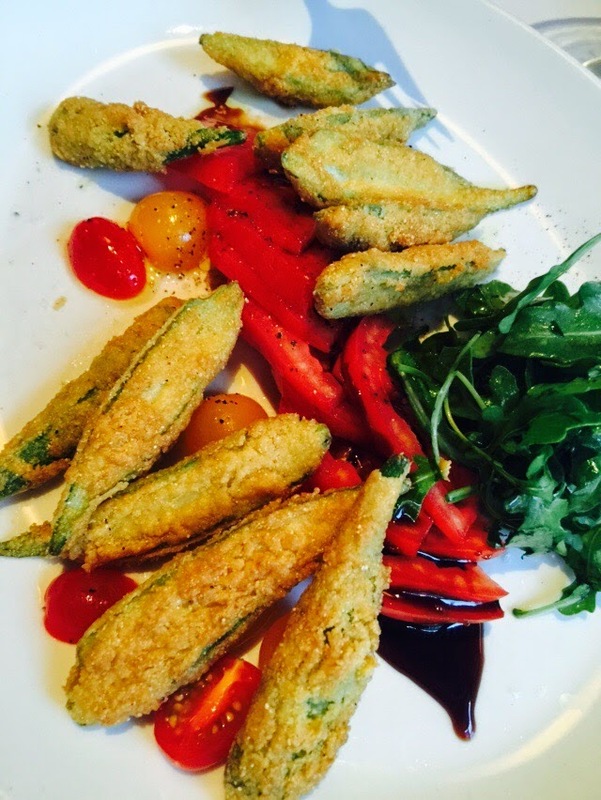 In addition to the pear and arugula salad I had, Deborah got this beautiful heirloom tomato and fried okra salad. It came with rocket lettuce, extra virgin olive oil and a balsamic gastrique. We didn't know what rocket lettuce was and pondered that burning question for a while but got distracted with all our eating and forgot to ask someone who would know. 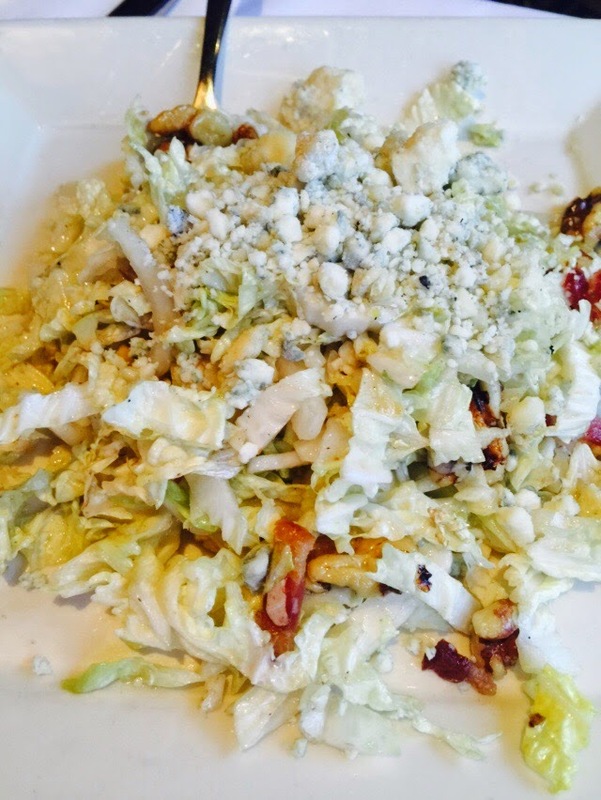 Dede opted for this Asian slaw made with Napa cabbage, blue cheese, bacon and walnuts with a warm vinaigrette. It was very good and very different. The verdict on the salads was that Dede and I both liked the pear salad the best, but Deborah preferred the slaw. They were all delicious, though, and I would order any of them again. We also chose three different entrees. These girls have the whole concept of Three Friends and a Fork down! 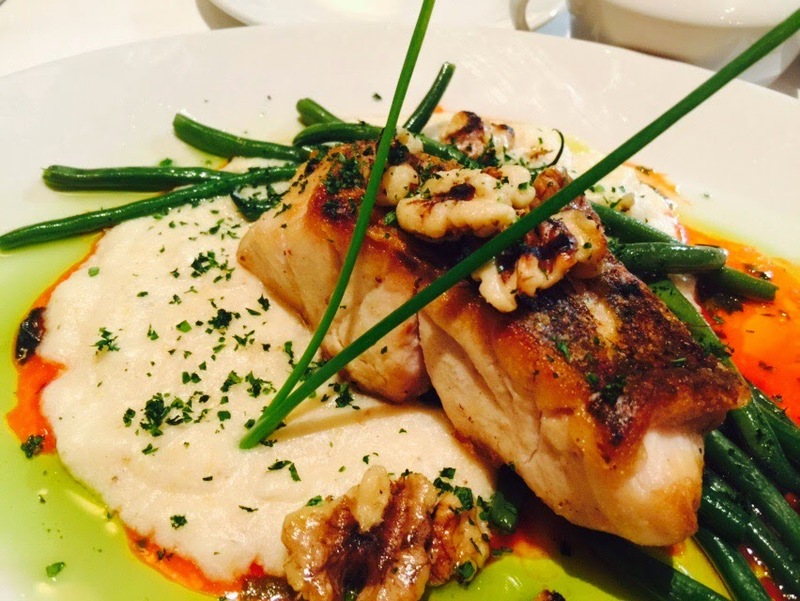 I picked the pan seared red snapper with stone ground grits, walnuts and hericots verts. I have to say, The Bottle has fish cooking down to an art. One of the hardest things in cooking is to get a beautifully browned piece of fish without overcooking and drying out the tender inside. The Bottle gets an A+ on both counts. And the fish was as fresh as any I have gotten at the beach. Those grits were not too shabby either! I ate every single grit! I can't believe I just wrote grit! Every Southern girl knows grits are never singular. Deborah also selected a fish entree. Her's was black grouper, which our server told us is considered the best grouper. I personally researched this to make sure he wasn't just pulling our legs, and he was telling the truth. Deborah's fish was sitting atop a mound of risotto and served with haricots verts. Her grouper was amazing, as was the risotto. 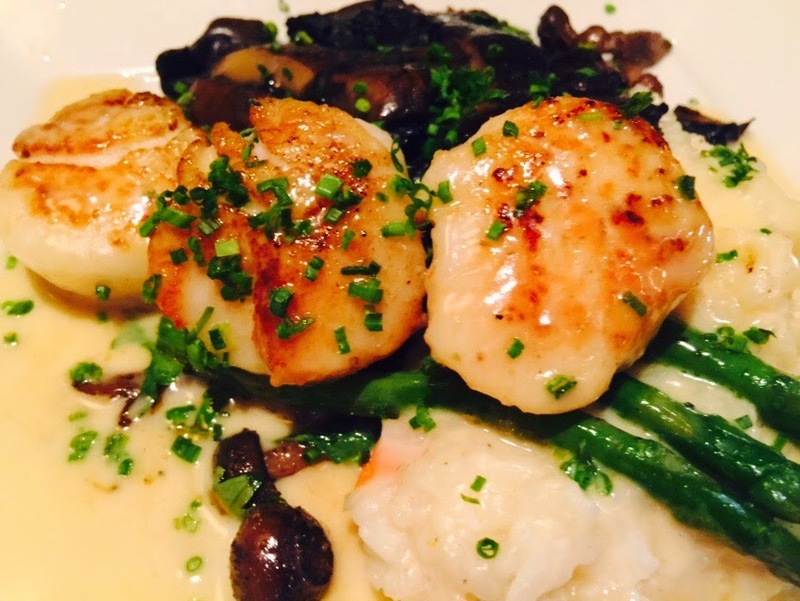 Not to be landlocked when the rest of us were sampling sea life, Dede's entree of choice was pan seared Georges Bank jumbo sea scallops. Those mollusks were buttery and sweet with a lemongrass buerre blanc, mushroom confit and tender asparagus. By this point we were pretty stuffed, but Dede and I couldn't resist sampling one little dessert. 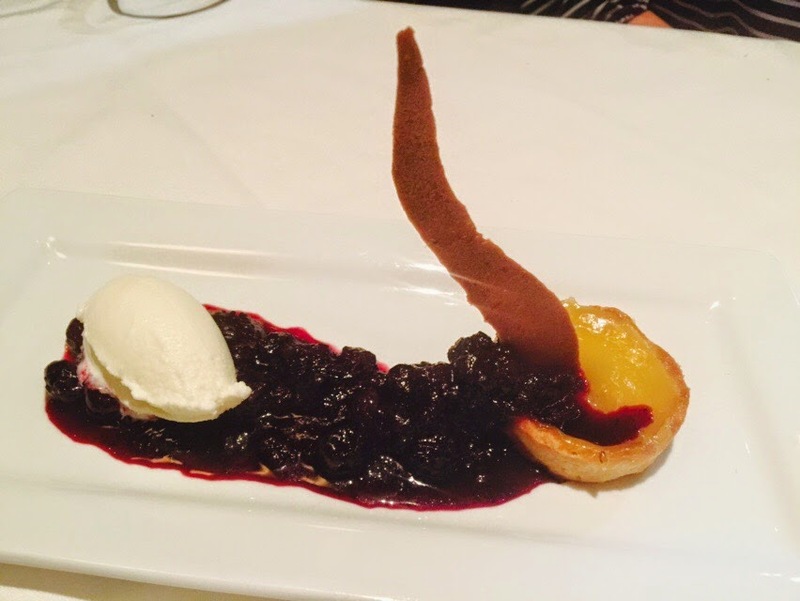 We picked the one we thought would be the least filling and most light, which was this little lemon tart with blueberries and a dollop of ice cream. Dede and I loved it. Blueberries always marry so well with lemon. Deborah, who didn't even taste it admitted that she did not like lemon desserts. Who knew?? I mean I knew she didn't eat anything with horseradish, but this was the first I had heard of her aversion to citrusy desserts. I say citrusy, because she also informed us she didn't like key lime pie either. The things you learn about your friends when you go out to eat! It was even more surprising because Deborah, like me, is usually a pretty adventurous eater. Again, it was another delicious night of fun and friendship and delicious food. 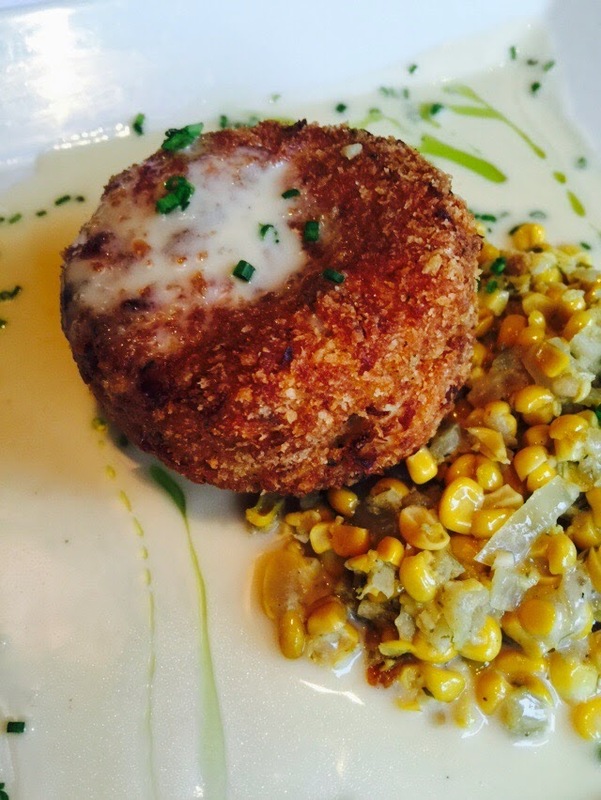 You definitely should make time to sample the creative cuisine at The Bottle. Three Friends and a Fork and all our dear friends give The Bottle 3 memorable Yums UP. These all sound wonderful and I love your tales of eating there. Makes me feel like I am at table with the judges on Top Chef. You know your food. Haha, Kim! You mean I know my eating! Thanks for stopping by!